While I was in New York, I shopped a “little”. And off course, beauty products were not excluded! I bought some products I already knew and had tried, but I wanted to try out some new stuff I heard about on Youtube. Over to Mascara. I bought 2 mascaras, one from Dior, which I always buy. It’s the Diorshow Iconic in the color 090 Black. It’ supposed to give length and volume to your lashes and it has a bristle to give you a lash-by-lash separation. Personally I love using this mascara, it’s a bit more expensive (around 28.5$ in the US, and around 30€ in Belgium), but I think it’s worth it. 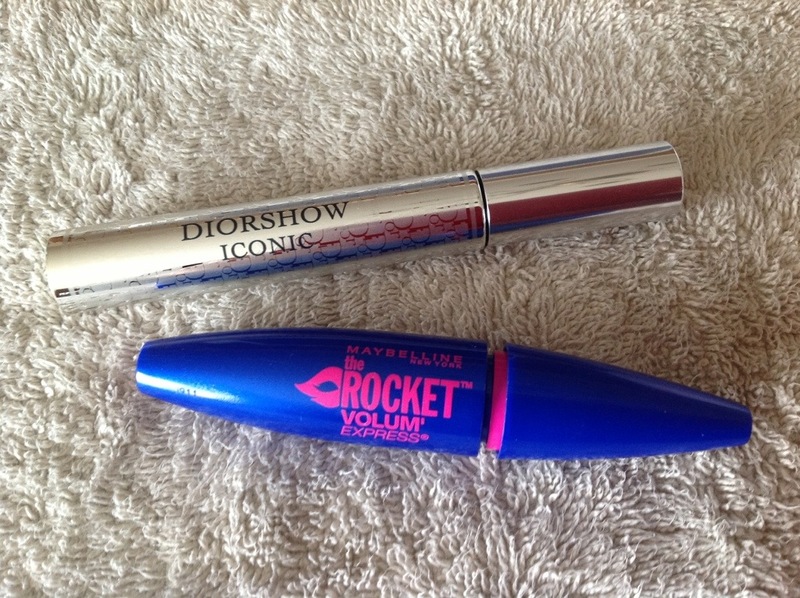 The second one I bought is the Maybelline The Rocket mascara. I wanted to try this one because I heard a lot of beauty gurus on Youtube talking about it. I used it for a good 3 weeks now, and I love it! It also has a special bristle, which makes it easy to separate your lashes. It gives volume to your lashes. And what’s interesting with the summer in sight, is that they also have it in a waterproof version. I think it does what it promises, and that for a very good price! (7-9$ in the US, and around 14€ in Belgium). Next I wanted to try some lip products. One of them is the EOS (smooth sphere) lip balm. Mine is in summer fruit. The packaging of it is so cute. It is easy to put on, and it smells great. It’s not to greasy, like some other lip balms are. And another interesting aspect is it stays on for quite some time. You do need to re-apply it after a few hours, but thats the case with most lip balms in my opinion. I’m not sure if you can find this product in Belgium. (Around 3-4$ in the US, ? Belgium). 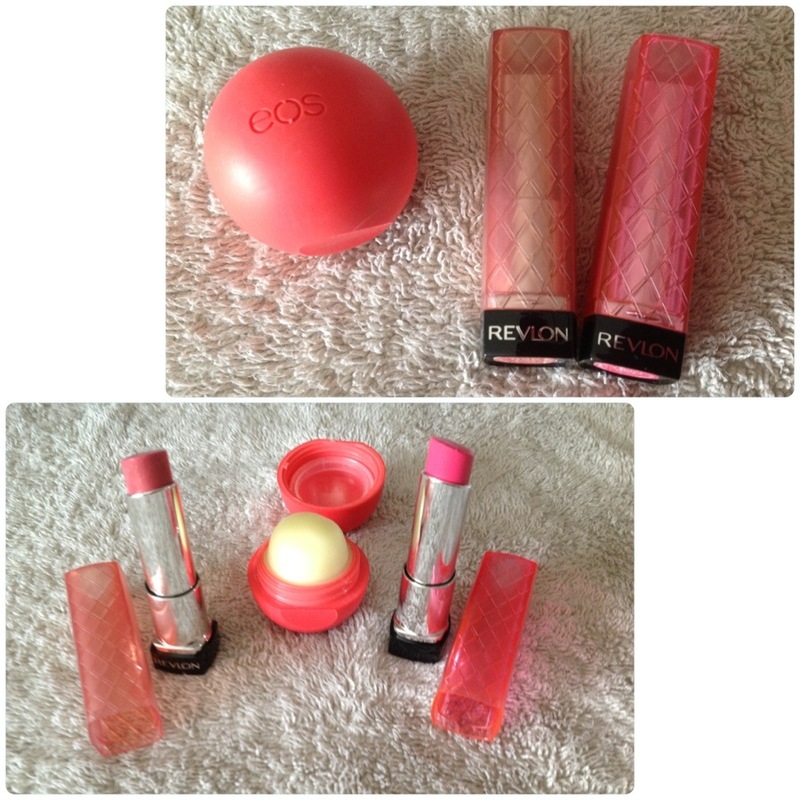 Some other lip products I got were the Revlon colorburst lip butters. Also another product Youtubers were talking about, so I wanted to try these. I got ‘090 sweet tart’ and ‘025 peach parfait’. The first one is a brighter pink/rose one, the second is more of a darker peach color. I have to say that the pink one gives more color on my lips, the peach one gives not much color on me. The lip butters are a combination of lipstick and a lip gloss. Some of them are really pigmented and give a lot of color like lipsticks do. On the other hand they also moisturize a bit and some of them look more glossy. (Prices are around 7-8$ in the US, in Belgium they are around 12-13€ and they can be found at some Inno Gallerias, Planet Perfum). Next are some eye shadows. I got a Wet n wild trio and an Inglot freedom palette. Both brands are not for sale in Belgium, so I was very curious to try them, because again, I heard about it on Youtube. I like to keep my make-up quite neutral, therefor I chose more neutral colors. The Wet n wild trio is in the shade ‘380B Walking on Eggshells’. I have to say that these shadows are quite pigmented and are very good quality for the low price (around 3$ in the US). The palette is devided into 3 parts and each says where the color should go, so one is a highlight for the browbone, the second one is a darker color for the crease, and the third one is a color for the eyelid. 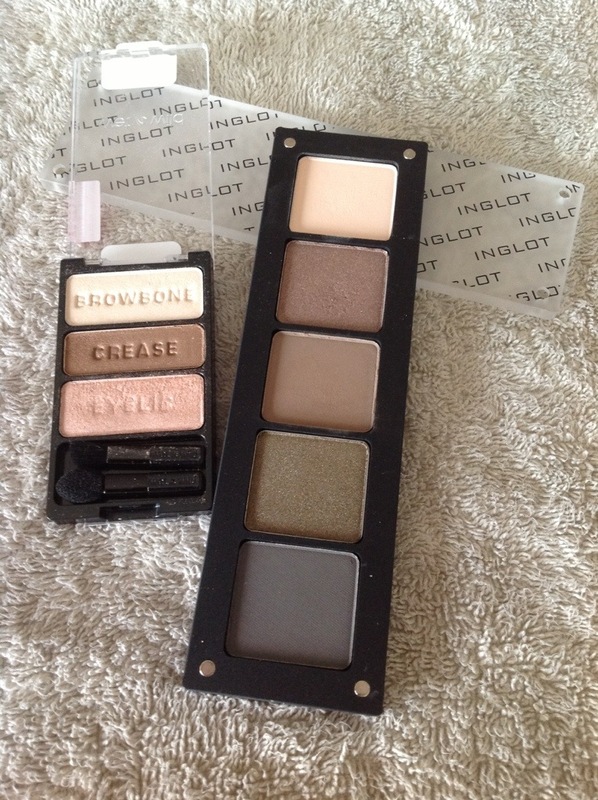 Another palette I got is the one from Inglot. I used their freedom system to make my own palette. You can choose from different sizes of palettes, and you can fill them up with the colors you like. The palette works with magnets, so your pans don’t fall out. I got the one where you can put 5 square colors in (11$ in the US). These eye shadows are very pigmented, so they last a long time. It’s a bit more expensive the first time you buy it, because you also need to buy the palette. But once you get that, the colors are only 6$ a pan (in the US), with the advantage you can choose your own colors. The next three products I also saw on Youtube, surprise… surprise. The first one is the Covergirl & Olay Simply ageless eye concealer. It’s like the name says, an eye concealer to cover up the dark circles under your eyes. Mine is in the color 210 light. I like the consistency of it because it’s a concealer, but it also has some moisturizer in it, so it doesn’t dry out your skin. (Around 12-13$ in the US, brand not sold in Belgium). The second one is the Benefit boxed powder in Coralista. It’s a coral blush powder. The packaging of this one is really pretty and also the coral color is. It comes in a box with an integrated mirror on the inside and a brush. (28$ in the US, in Belgium it’s 32€ and it’s being sold in Inno Galeria Antwerp). 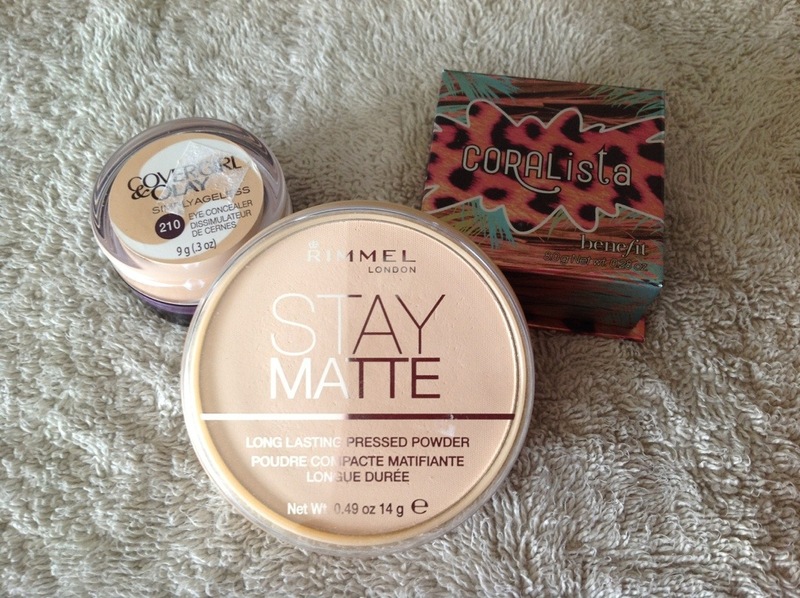 The third product is the Rimmel Stay matte long lasting pressed powder. This is a powder to set your make-up after you have put on your foundation. And it helps to keep the shine away for people who have a more oily skin. Mine is in 001 transparent. This is because I wanted it to look natural. (Around 5-6$ in the US, around 10€ in Belgium). The last thing I bought is the 217 blending brush from Mac. Mac brushes are kind of expensive (23$ in the US, 22€ in Belgium), but they are really good quality brushes. So, that are the beauty products I bought on my trip to NY. Stay tuned for more of my NY trip updates and a fashion haul! 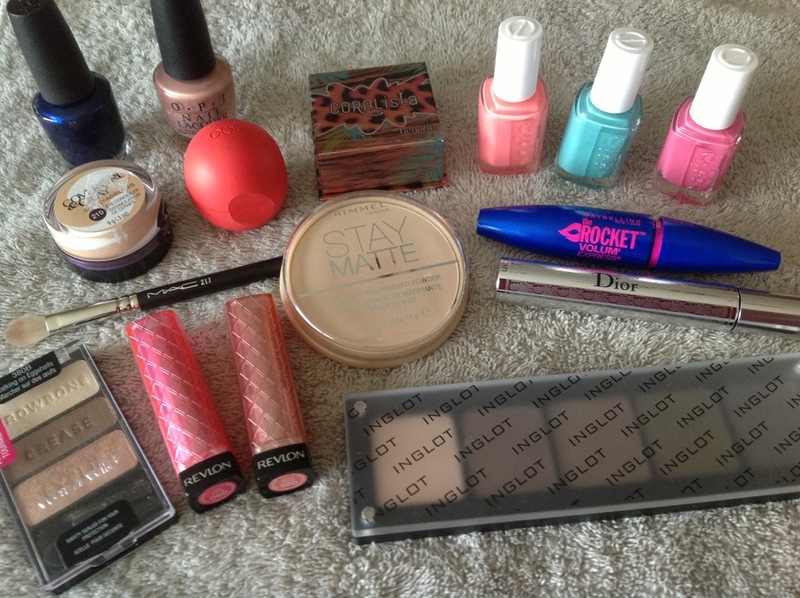 This entry was posted in fashion, Haul, Traveling and tagged beauty, haul, New York by missnathaliexo. Bookmark the permalink.